Single-use technology plays a pivotal role in the expanding biopharmaceutical industry. Trends in biopharmaceuticals are benefiting the global market for single-use systems and products, accelerating their manufacture and consumption. A recent study by BCC Research forecasts expansion at a five-year compound annual growth rate (CAGR) of 12.3% in the United States and 9.2% in Europe. Overall, the global market for single-use technology is estimated to reach $4.3 billion by 2021. Manufacturers of biopharmaceuticals are focusing on single-use technology, which has important applications in the bioprocessing of a large number of products such as vaccines, biologics, antibodies, and proteins. The production of biopharmaceuticals requires the handling of living organisms and thus requires cleaning and sterilization to eliminate contaminants. In addition, the raw materials required for bioproduction need to undergo a quality check. With the change in healthcare systems around the world, there is an increased demand for therapeutics at reduced prices. This has resulted in the creation of pioneering techniques such as single-use technology to reduce capital investment without sacrificing production rates and quality. Single-Use Technology for Biopharmaceuticals examines the global markets for these products, their applications, and end users. The range of products includes filters, bioreactors, containers, specialized single-use treatments, and antibodies or proteins that require specialized handling or customization. Technological improvements deliver economic benefits in the form of lower manufacturing costs, reduced maintenance, and limited water or sterilization requirements. The entry of additional single-use items is expected as contract manufacturing expands to supply this industry, according to BCC Research. For example, Lonza, a large biologics contract manufacturing organization (CMO), recently announced that it was building the first of up to five modular biomanufacturing facilities to house single-use bioproduction systems. The news came just weeks after Lonza revealed details of a single-use expansion at its Singapore site. Other CMOs, including Catalent, Patheon (which is being acquired by Thermo Fisher), and Fujifilm have entered the biopharmaceutical space by investing in single-use technologies and capacity. Vendors are also developing standalone alternatives to traditional stainless steel systems. GE Healthcare recently broke ground on its $176 million off-the-shelf biopharmaceutical manufacturing campus in Ireland, which will use FlexFactory single-use and KUBio modular platforms. KUBio is a prefabricated cGMP (current Good Manufacturing Practice) biomanufacturing facility that is operational in 18 months for a fraction of the cost, according to GE Healthcare. The KUBio facility is designed for flexibility and includes FlexFactory, a configurable production line that can improve operational efficiency and minimize infrastructure. Thermo Fisher has begun using its single-use technology in combination with its SmartFactory automated technology to help design and develop production plants for end users. Thermo Fisher has opened a UK test center to allow biopharmaceutical industry customers to test single-use production technologies. The “customer evaluation center” has a replicate of a clean room and houses single-use mixers, bioreactors, fermenters, and other single-use biomanufacturing technologies. In addition to allowing customers to try the technology, the site will also host training sessions. Thermo Fisher recently bolstered its single-use technology business with the acquisition of Finesse Solutions, its long-term supplier of measurement and control solutions for bioprocessing applications. Through 2015, more than 90% of biopharmaceutical facilities were already consumers of single-use devices as part of daily operations. 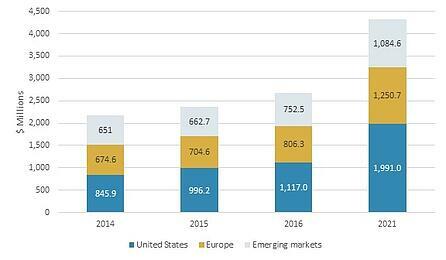 The United States remains the largest consumer market for single-use biopharmaceutical devices, but emerging markets are predicted to achieve a 7.6% CAGR through 2021. The major flourishing markets include India, China, and South Korea. Hospitals, research facilities, and laboratories are all contributing to this growth. In China, a WuXi Biologics facility is purported to become the world’s largest single-use mammalian cell culture manufacturing site when it opens this year. The planned 28,000L of bioreactor capacity is being supplied by Thermo Fisher through 14 2,000L single-use systems. In addition to the clinical- and commercial-scale vessels, Thermo Fisher has supplied ten single-use bioreactors as seed vessels at the site. In India, Dr. Reddy’s will expand its biosimilar manufacturing capacity in Hyderabad by 4,000L using GE Healthcare’s FlexFactory platform. The site currently has a total bioreactor capacity of 4,800L (four 1,000L and four 200L stainless steel systems). The expansion will almost double its capacity, adding four GE Healthcare 1,000L single-use bioreactors that are expected to be operational in fiscal year 2019. The expansion marks the first installation in India of GE’s FlexFactory, which, as noted above, is its biomanufacturing platform incorporating single-use equipment and consumables, central automation, installation, and ongoing facility support and maintenance. “Costs have declined thanks to the disposal and recycling of single-use items. Disposable or single-use bioreactors are becoming an indispensable tool in the bioprocessing industry. They are replacing glass beakers or stainless steel tools that must be sterilized and reused,” says Robert Hunter, senior healthcare editor at BCC Research.